It can be frustrating trying to find plants to grow in dry, shady places. The usual solution is a carpet of periwinkle or masses of the dull rosettes of Euphorbia robbiae – plants best suited to supermarket car-parks. You may need to spend time searching specialist nurseries for more colourful and interesting plants that will flourish in dry shade, but it is worth the effort. The first thing to do is to look at what is causing the shade. If it’s a high wall or fence, then be happy. All you need to do is dig lots of manure or compost into the soil, keep improving it every year with whatever organic matter you can lay your hands on, and there is a multitude of shade-loving plants to choose from. Trees and shrubs that create shade are more of a problem. They steal moisture as well as robbing the soil of its nutrients. Large beech trees are the worst offenders as their roots are very close to the surface, so that even getting a spade into the soil is difficult. The most widespread cause of dry, gloomy areas is conifer hedges, but even here there are plants that will thrive. You still need to nourish the soil and mulch around your plants. Yes, you’ll be feeding the hedge too, but your plant will be getting a lot of the goodness first. 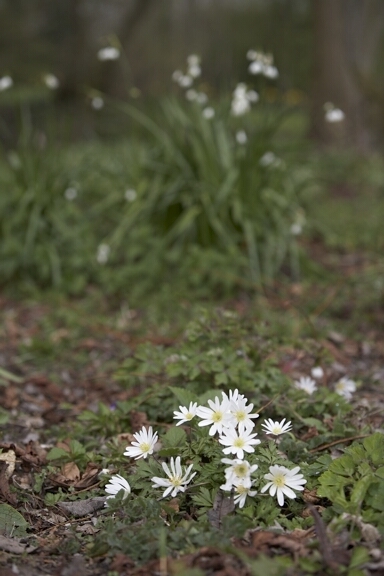 The native wood anemone, Anemone nemorosa will soon form low carpets of starry flowers. Starting to flower during March, the species is usually pale blue, but you should also try Anemone nemorosa ‘Vestal, which is brilliant white and doesn’t start flowering until April. The whole plant dies back into the ground by July, leaving space for other plants to grow through. An alternative plant that does this is the celandine, Ranunculus ficaria. In many gardens this is an annoying weed that is difficult to eradicate but there are many cultivars that are worth growing. The delightfully-named ‘Brazen Hussy’ has polished-bronze leaves and short stems of golden-yellow flowers. Another British native, Iris foetidissima, is often recommended for dry shade. Its flowers are dull, so grow Iris foetidissima v Citrina, which has bright yellow flowers and the same orange berries in the autumn. Iris foetidissima ‘Fructo Alba’ doesn’t clump up as quickly as the species but has sparkling white berries in the autumn. One more native to try is the perennial honesty, Lunaria rediviva. Less invasive and smaller (its gets to about 50cm tall) than the biennial honesty it has pale mauve flowers that have a strong cloves-and-citrus perfume. It may sound an unlikely plant for the garden, but the Aspidistra will thrive in milder climates outdoors. The cold, unwelcoming gloom of those Victorian parlours with which the Aspidistra is more usually associated is not too dissimilar to the conditions under a tall hedge. There are variegated forms, but these do not do as well outdoors as the common green-leaved Aspidistra elatior. Here in Hertfordshire I have seen it flourishing in the poor soil under a tall conifer hedge. I plan to try the same trick in my own garden. It was underplanted with another plant more often thought of as a house plant, Saxifraga stolonifera. This has hairy leaves, the shape of scallop shells, that are maroon underneath. It sends out runners that have little plantlets attached to them, like strawberry plants. You should soon have a small colony. Plants that originate in Mediterranean climates, where the summers are dry and the winters moist, will generally adapt very well to dry, shady conditions. Pittosporum tobira is an evergreen shrub that gives some structure during the winter. Its large leathery leaves are sweetly scented. Coronilla valentina subsp glauca ‘Citrina’ is also evergreen, but a much more delicate plant than the Pittosporum. It has small pale lemon flowers, like those of a pea, in January and February. 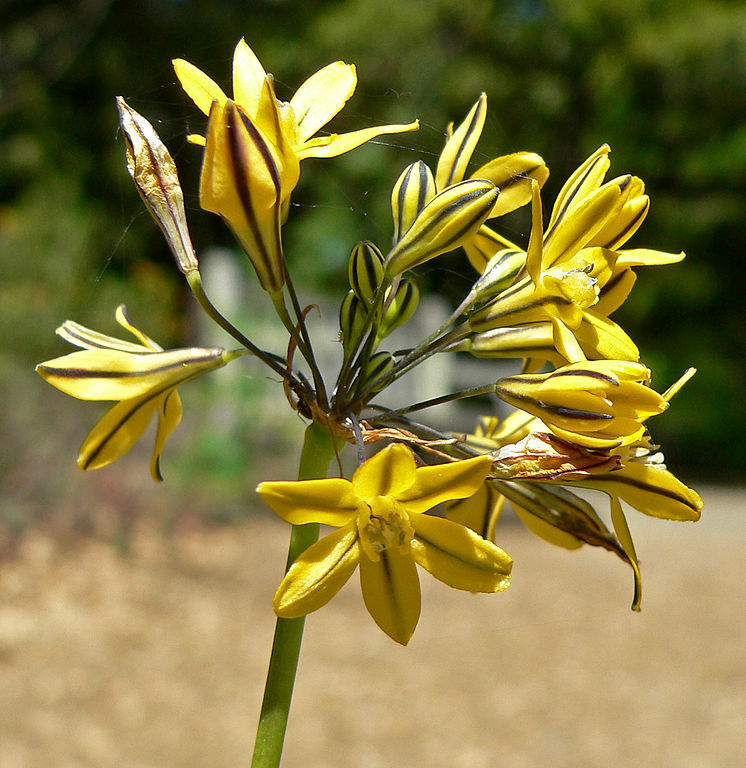 Most bulbs need plenty of sunlight but the Californian Tritelias originate from the edges of oak forests and need shade. Flowering in early summer, they all have loose, round heads – imagine agapanthus that have been picked at by blackbirds. T. penduncularis has creamy-white flowers. There are several varieties of Tritelia laxa in a range of pale mauves and violets. Some shade-lovers that generally prefer damper soils will perform adequately where there is little moisture. In rich, moist soils Campanula latifolia can romp around too much but on dry soils its enthusiasm is kept in check. ‘Brantwood’ has rich purple flowers in July; macrantha ‘Alba’ white ones and flowers later. Both grow to about three feet but as with most plants, this can vary with how dry and dark the conditions actually are. Generally the drier and darker, the shorter and less vigorous the plant. Adenophera bulleyana is a relative of the Campanula with tall thin spires of blue bells. For bright colours later in the year grow the orange-flowered Begonia sutherlandii. This will not survive very cold and wet winters but usually leaves a few seedlings behind. Begonia grandis subsp evansiana Alba seems to be hardier. It too, seeds itself about. While it is always frustrating to lose plants that are not truly adapted to the stresses of dry shade, it is sometimes worth experimenting. I planted some bridal wreath, Francoa sonchifolia, under the leylandii, not hoping for much, and am delighted to see that they are thriving. The bright apple-green foliage is evergreen and it has tall spires of soft pink flowers. I’m going to try the larger-flowered white form, Francoa ‘Confetti’, in the same area in the hope that the flowers will lighten the gloom even more. Plant it at the edge of the shade, otherwise the flower stems will bend over towards the light. These are some of the plants that work in my garden. There are more: the epimediums, Arisarum proboscideum, ferns such as Polypodium cambricum, the new perennial hollyhock hybrid Alcea x althaea ‘Park Allée’. And many more. Once you start looking hard you’ll begin to wonder what all the fuss was about.